As the Parish Church was a mile and a half ouside the village, Rev William Edward Crosse Crosse 1871-1930) when he was appointed Rector in 1906 set about obtaining a more accessible place of worship within the village. 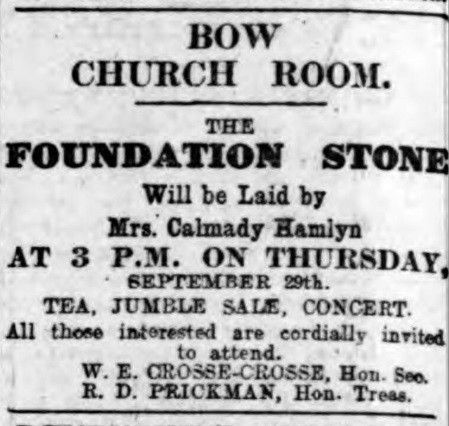 This charity was set up in 1910 by Rev Crosse, and two churchwardens, Richard Dunning Prickman and Lt Col Alfred Matthews (of Grattons), who as trustees of the United Ecclesiastical Charities sold a piece of land on the main street in trust to Alfred Burrow for the erection of what is now known as the “Church Room”. This land (72 square yards) was part of the yard attached to the cottage occupied then by postman Joseph Chowens. The architect was J Archibald Lucas, who had designed Fair Park for Dr Haycroft in 1901. After a tendering exercise Mr W F Pearce of Chudleigh was appointed as builder. 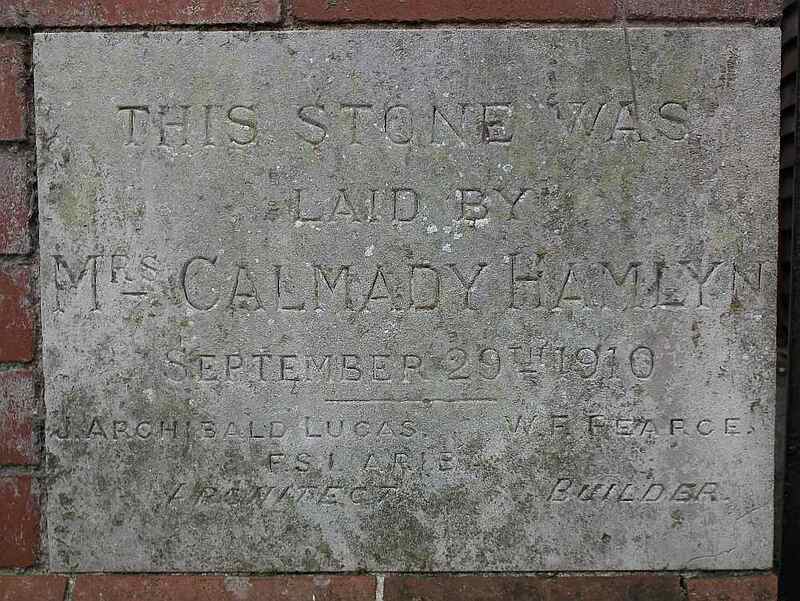 Mrs Susan Emily Calmady-Hamlyn (1845-1936) of Bridestowe but formerly of Paschoe, Colebrooke, laid the foundation stone on 29 September 1910. She was the widow of Rev Charles Holley but changed her name by deed poll after the death of her sister, Fanny Gertrude Sillifant-Hamlyn in 1901. 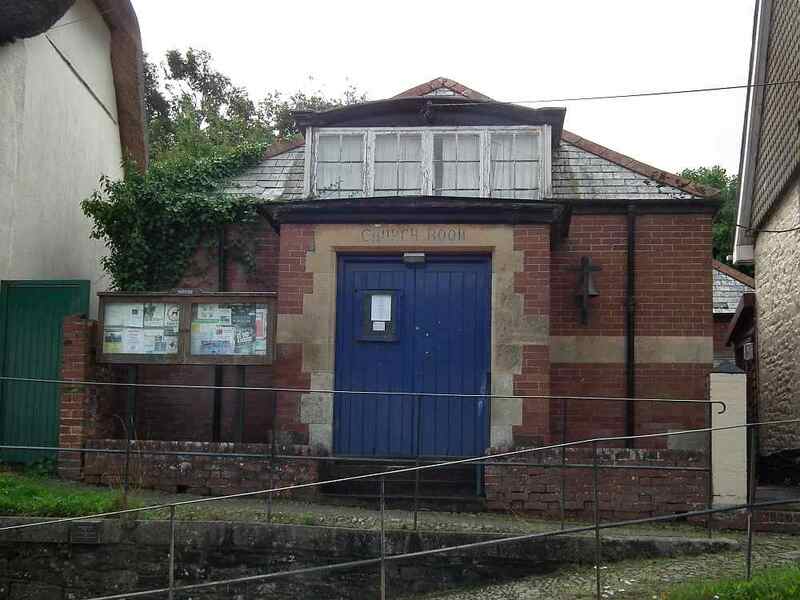 The building was funded by public subscription, the £300 having been raised before the building work commenced. 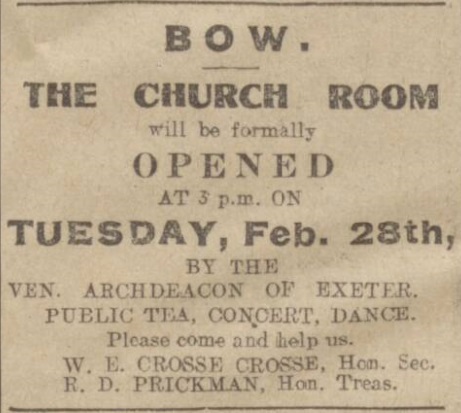 The room was officially opened by the Archdeacon of Exeter on 28 February 1911. 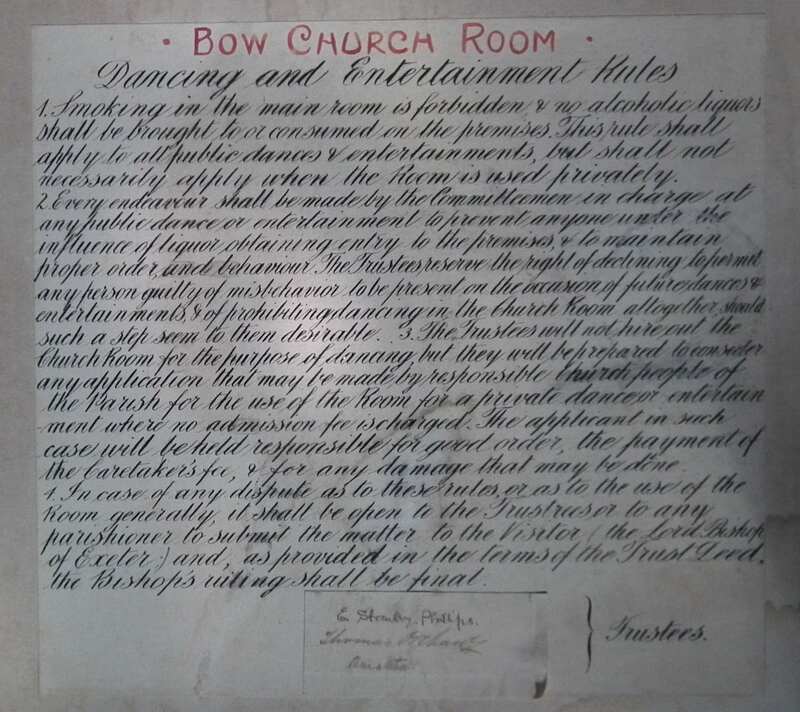 It was permitted to be used for church services, Sunday school, a lending library and as a place of meeting for the "clubs of the labouring, manufacturing or other poorer classes of the Church of England" of Bow Parish, and was in use until recently.